The trinity is comprised of the “star variables” y*, u*, and r*, which denote, respectively, potential output, natural rate of unemployment and neutral interest rate. Changes in policymakers’ estimates of these variables thus reflect reassessments of the economic environment in which policy must operate. The only way to resolve the question in a satisfying way is to test it: to push the economy beyond the estimated potential growth rate and see if inflation rises…. Bernanke argues that Fed officials are willing to be a little patient with the economy, to see whether running it a little hot brings more workers into the labour force and encourages productivity-enhancing investments. It certainly seems clear to me that overshooting is the right way for the Fed to err…. But I am less confident than Mr Bernanke in the Fed’s openness to overshooting. 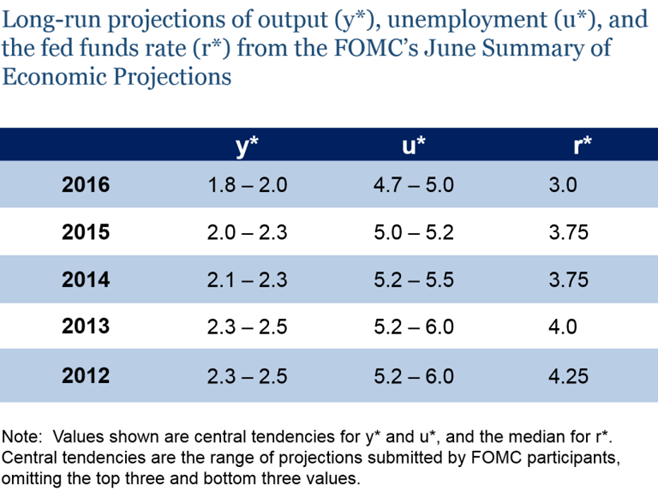 It did not exactly intend to run the unemployment rate experiment that demonstrated how wrong its previous projections had been…. 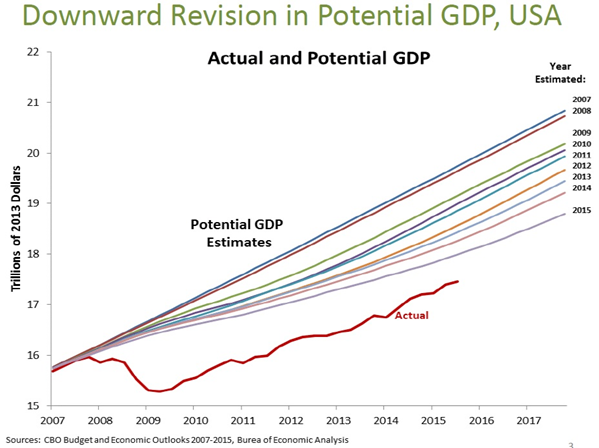 Now, the Fed looks all too willing to revise down its GDP growth projections without ever really testing them…. There is far too little radicalism at the Fed. It risks making permanent a low-growth state of affairs which is largely a consequence of its own excessive caution. Nalewaik suggests that a return to a world in which inflation expectations and actual inflation become more tightly linked, as they were before the mid-1990s, may not be in the cards. As Nick Rowe tweeted, if the Fed´s inflation target is credible, as it has been for more than 20 years, there should be no correlation between expected and actual inflation. This is an application of Friedman´s “Thermostat”. In 2003, Friedman gave the simplest explanation for the “Great Moderation” with his “thermostat analogy”. In essence, the new found stability was the result of the Fed (and many other Central Banks) stabilizing nominal expenditures. In that case, from the QTM, according to which MV=PY, the Fed managed to offset changes in V with changes in M, keeping nominal expenditures, PY, reasonably stable. Note that PY or its growth rate (p+y), contemplates both inflation and real output growth, so that stabilizing nominal expenditures along a level growth path means stabilizing both inflation and output. The thermostat analogy come out very clearly in the panel below. While monetary policy was loose and NGDP growth was trending up, the outcome was runaway inflation. 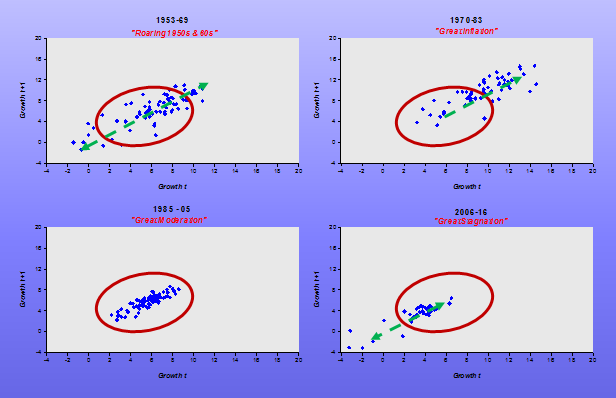 To get inflation down, Paul Volcker experimented with NGDP growth, bringing it down. 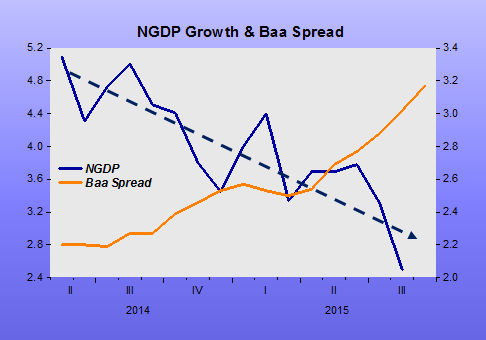 While the Greenspan Fed kept NGDP growth at an adequate stable level, the Bernanke/Yellen Fed first depressed NGDP and then kept it growing at an inadequate level. That fact is sufficient to explain both the “sluggish” recovery and “too low” inflation. Central bankers and governments must come up with new policies to buffer their economies against persistently low interest rates that threaten to make future recessions deeper and more difficult to avoid, a top Federal Reserve official said on Monday. Setting higher inflation targets, tying monetary policy directly to economic output, instituting government spending programs that automatically kick in during economic downturns, and boosting investment in education and research are all policies that should be considered, San Francisco Fed President John Williams said. In general, with policymakers sounding more agnostic and increasingly disinclined to provide clear guidance, Fed-watchers will see less benefit in parsing statements and speeches and more from paying close attention to the incoming data. Ultimately, the data will inform us not only about the economy’s near-term performance, but also about the key parameters—like y*, u*, and r*—that the FOMC sees as determining that performance over the longer term. 5.) Inflation will accelerate. I think 2016 will be the year that economic resources become sufficiently scarce to push inflation back to the Fed’s target. I know this may seem like a wildly optimistic call given the persistence of low inflation during this cycle. I would say TD is very optimistic! My question: How can resources become “sufficiently scarce” if nominal spending growth is going down? That´s another example of the “hare chasing the fox”, meaning it is “potential output” that is in pursuit of actual output! The Federal Reserve Board released an updated version of its large-scale model on the U.S. economy that may hold clues into why policy makers pivoted at their meeting earlier this week toward a December interest-rate increase. Federal Reserve officials just aren’t sure how much stimulus their zero-interest-rate policy is providing. At issue is the level of the so-called natural, neutral or equilibrium rate of interest, which is the borrowing cost — adjusted for inflation — that keeps the economy at full employment with stable prices. Economists from the academic world and even within the central bank are vigorously airing differing views on where the rate lies in the aftermath of the worst recession since the Great Depression. The uncertainty is yet another reason for Fed officials to go slowly as they begin raising interest rates for the first time since 2006. What’s at stake: The natural rate of interest is a key ingredient in the recent discussion of secular stagnation, and more generally in New-Keynesian models of the Great Recession. But the concept is often poorly understood, in part because the term refers to different things for different people. Richard Anderson writes that the Swedish economist Knut Wicksell based his theory on a comparison of the marginal product of capital with the cost of borrowing money. If the money rate of interest was below the natural rate of return on capital, entrepreneurs would borrow at the money rate to purchase capital (equipment and buildings), thereby increasing demand for all types of resources and their prices; the converse would be true if the money rate was greater than the natural rate of return on capital. Axel Leijonhufvud writes that Erik Lindahl (1939) and Gunnar Myrdal (1939) refined the conceptual apparatus, in particular by introducing the distinction between ex ante plans and ex post realizations and thereby clarifying the relationship between Wicksellian theory and national income analysis. The circles around the level of “potential output” (y*) and the level of the natural rate (NR) represent the “uncertainty” about their estimated values. 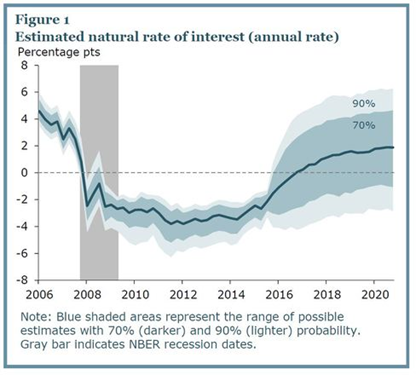 For example, San Francisco Fed senior economist Vasco Cúrdia argued in a paper published earlier this month that the equilibrium rate may have dropped so much that “monetary conditions remain relatively tight despite the near-zero federal funds rate.” He provides a chart which indicates that at present the “natural rate” could be anywhere from -3% to 6%! Similar uncertainty surrounds the value of “potential” output. In essence, facing the “estimation” problem, the situation of monetary policy makers is well captured by this picture! An alternative, to try to overcome the “estimation” problem would be for the Fed to try some “experimentation”. That has happened before. In March 1933, in the depths of the Great Depression, President Roosevelt decided to “innovate” and free the economy from the “gold standard shackles”, delinking from gold. The effect was immediate as illustrated below. On Oct. 6, 1979, the Federal Open Market Committee—under the leadership of Paul Volcker—made a decision that would come to be known as a key moment in U.S. economic policymaking, a turning point in the history of the Federal Reserve that would forever alter central banking. And those are the understatements. 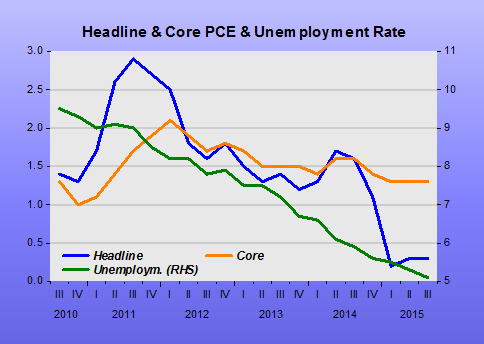 So, what did the FOMC do? It made a short-term change in the method used to conduct monetary policy, from making adjustments in the federal funds rate to containing growth in the monetary aggregates. (Yes, the Fed now targets the funds rate again—the 1979 change was reversed in 1982—but more on that in a minute.) This meant the Fed would focus on controlling the amount of reserves provided to the banking system, which would ultimately limit the supply of money. By many, that “experiment” was seen as a failure. Nevertheless, judging by the results it worked, in that inflation was permanently brought down. In what follows I´ll give a “liberal” interpretation of the experimentation, based on NGDP. The interpretation is not so farfetched because the NGDP targeting concept was extensively discussed both by the Volcker Fed in 1982 and by the Greenspan Fed in 1992. 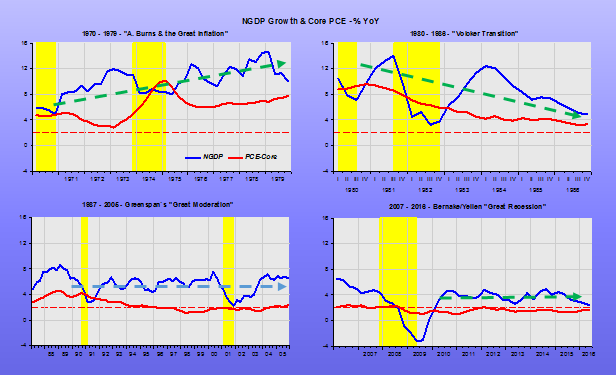 The first charts show how rising core inflation was the outcome of a rising NGDP growth. 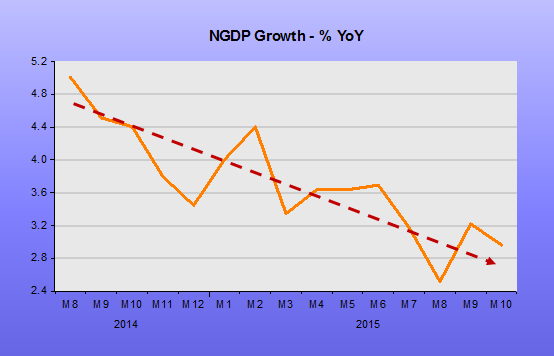 The follow up shows that by “downsizing” NGDP growth inflation was brought down. This was followed by Greenspan´s “consolidation” in 1987-92 and almost “smooth sailing” from then to the end of his mandate in January 2006. These last two periods came to be known as the “Great Moderation”. I interpret the “experiment” as trying to find first the level and then the stable growth path for NGDP. 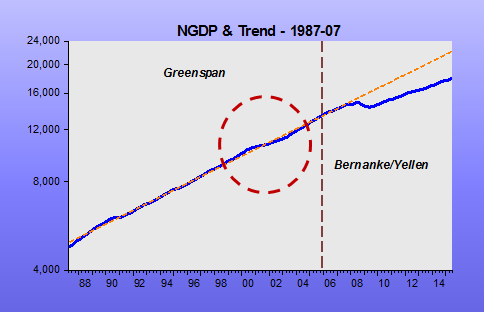 As the next chart shows, by 1987 the Fed had “hit” on the NGDP level and from then onwards NGDP growth rate was stabilized, i.e. kept close to the trend path. 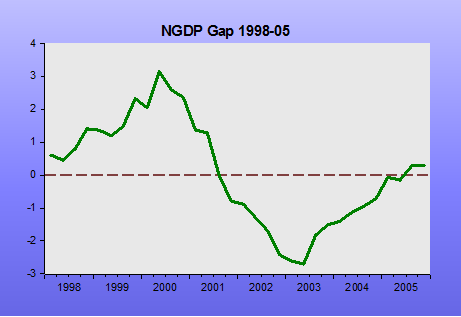 There were “mistakes” along the way, notably in 1998-03, when NGDP first rose above trend and then fell below, but by the end of 2005, NGDP was back on trend. 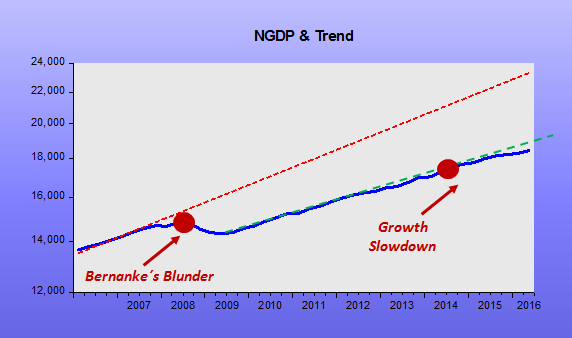 Soon after taking the Fed´s helm, Bernanke allowed NGDP to begin once more to fall below trend. This was magnified in 2008, probably because of the Fed´s exclusive focus on headline inflation, which was being propelled by an oil and commodity price shock. In an environment where the financial system was “wounded”, allowing NGDP to crumble is mortal! At present we have the opposite situation of the 1970s. Instead of high/rising inflation due to rising NGDP growth, we have low/falling inflation due to low/falling NGDP growth. So this time around it may be fruitful to devise an NGDP based experiment in reverse. 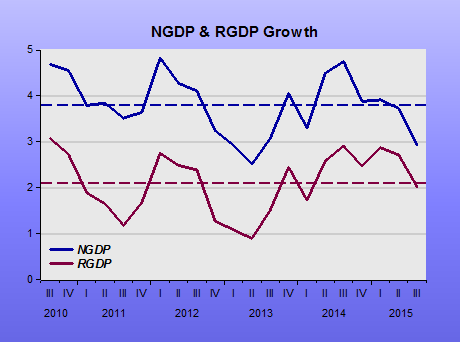 Try to establish a higher level of NGDP that when attained is “consolidated” through a stable NGDP growth rate. This “experimentation” would be much more helpful than spending time on “estimation” of the “natural rate of interest” or the “potential level of output”. The supply side of the United States economy can only grow by 2% a year, and so the U.S. Federal Reserve and Wall Street are “making a big mistake” in assuming the domestic economy “cannot overheat,” said Jim Paulsen, chief investment strategist, Well Capital Management on May 21 to CNBC. In fact, there is the threat “you’re going to aggravate costs, [and] push interest rate pressures,” Paulsen warned. It is hard to know where to begin with Paulsen’s analysis. First, can Paulsen name a single industry that is supply-constrained, that is now rationing output by price? If so, I want Paulsen to name that industry, so I can buy a related ETF. Paulsen also ignores that the U.S. supply side has globalized since the 1970s. If more steel, autos, computers or architectural services are demanded in the U.S., the supply side is international. Surely, Paulsen cannot believe there is not 2% more capacity in global supply lines (most of which are begging for business, btw)? Unit labor costs in the U.S. are up 5.8% in the last eight years, and labor income as a fraction of business income declining in the U.S. for decades. Maybe this will change, but for now labor costs are nearly deflationary. The Economist magazine recently reported there is $12 trillion in cash sitting in U.S. banks and money market funds, earning nearly zero percent interest. And Bain & Co. is predicting capital gluts as far as the eye can see, at least for the rest of this decade. How do you get higher interest rates with capital gluts? People in expensive single-family detached neighborhoods do not like sky-rise condos with ground-floor retail erupting next door. In a nutshell, this explains why the U.S. may have housing inflation from time to time. Local housing markets may in fact be supply-constrained. Whether such local regulations lead to national inflation, or should determine central-bank monetary policy is an interesting question. 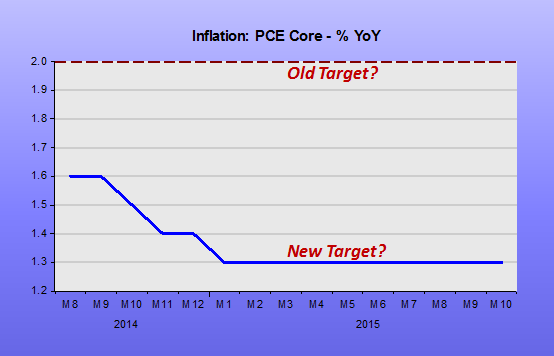 Probably, the Fed just has to live with a little inflation from this quarter. The main economic problem remains a lack of aggregate demand, in the United States, and globally. Not only that, it sometimes takes a round of inflation to stimulate supply—think oil markets, or even housing markets. The route to greater supply is paved by inflation. Life is not perfect, and that is another example thereof. So, the Fed should print more money.